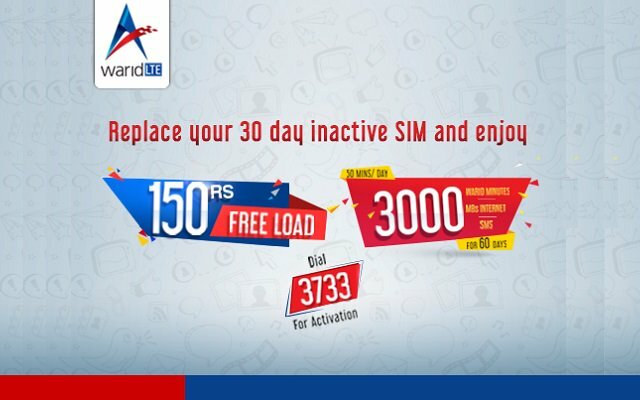 If you have not used your Warid SIM for more than 30 days, then Warid brings an exciting offer for you. With Warid SIM Lagao Offer Enjoy Rs.150 Balance Free. So get your new Jazz-Warid sim now from your nearest Warid Business center or retailer. You will get Rs. 150 instant load with unlimited validity. Not only this, you will also get 3000 Warid minutes, 3000 SMS and 3000 MBs LTE internet. In addition to it, you can also get a daily bonus reward of 100 Warid minutes, 100 SMS, 100 MB LTE internet on using Rs. 8+tax balance daily. Simply dial 3733 from your new Jazz-Warid sim to avail this offer. Daily bonus given on usage of Rs 8+tax balance will be valid till 90 days from the date of re-activation of SIM. Your SIM is your identity. Only use SIMs issued through Biometric System verification- PTA.